1-800-FLOWERS.COM now has a sister site, 1-800-BASKETS.COM. At 1-800-BASKETS.COM you can find a large selection of beautiful gift baskets to make any one’s Christmas merry. Below are a few gift baskets you can order from 1-800-BASKETS.COM. 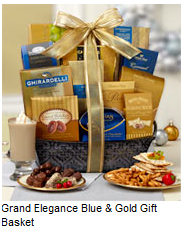 The Grand Elegance Blue and Gold Gift Basket will delight that special chocolate lover. It comes with, an embossed metal basket, .8oz Brown & Haley® Almond Roca® Buttercrunch Toffee, 1.9oz flatbread crackers, 3oz honey wheat braid pretzels, 8oz sesame crackers, 1oz Fannie May® Pixies® Cocoa, 2.55oz Ghirardelli® White Mocha Cocoa, .97oz dark chocolate orange cream Truffles, 3oz caramel filled caramel medallions, 7oz chocolate starlight mints, 4oz peanut butter barrels, 4oz World’s Finest® Chocolate Covered Caramel Whirls®, 3.5oz World’s Finest ®Chocolate Covered Pretzel Balls. Related Wordless Wednesday | Tis The Season! 1-800-BASKETS.COM offers same day delivery so you will be certain that your gift will arrive in time for Christmas. To kick off the start of the 12 Days of Christmas Giveaway, Healthy Moms and 1-800-BASKETS.COM is giving away a $50.00 gift certificate to one lucky reader. (This gift certificate can be redeemed at 1-800-BASKETS.COM and 1-800-FLOWERS.COM)All you need to do is leave a comment at the end of this article. This would be great for sending a gift to someone. Thanks for the opportunity. What a wonderful contest. There are so many items that I would love to get at 1-800-Baskets.Com. I love idea of giving a basket as a gift. These gift basket choices are so fine! Those baskets sure are pretty!! I would love to win one for the holidays!! I already follow you on Twitter too. Great prize! Hope I win. Fabulous baskets! I'd love to win one of these and give it away as a Christmas gift. So many great baskets, how would I choose? Wow, these baskets are amazing. I don't know how I could ever choose. I would use it to send my mom a gift. I would love one of those baskets to have on hand for the holidays. I always forget someone! They would be great to send to my mother! thanks for the giveaway these baskets look so bountiful! These baskets look so delicious. I love these gift baskets!! Wow thats lovely i would like to subscribe, this is a wonderful giveaway offer that i have ever found before. Do they do wine baskets? Cuz that's SO a present for my dad. We love gift baskets for gifts. Excellent giveaway. Thanks. There are a lot of nice baskets to choose from. And I'm following you on Twitter. I've been a fan of this type of gift giving for YEARS! This would be great to get some gifts this Christmas! These are baskets of joy and thoughtfulness, each one is delightful and I think this will be “Santa's” newest shopping site! This would be a great gift for a friend or family member. THanks for the chance! Id love to win! I follow on google friend. How nice! those looks so good! I would love to win this so I could send a basket to my daughter who is 1,000 miles away at college. Because of work and finances she will be unable to be home for Christmas. This would be a mood brightener for her. I don't know anyone that doesn't love to get a gift basket. How wonderful. Thanks for this giveaway. Gift baskets rock! i would love to win a gift certificate for a basket… it would be perfect for our families “white elephant” gift exchange! They have such wonderful gift baskets! I'm a FB fan (under my name, Piroska). I joined the Healthy Moms Network. Iam a subscriber to Health Moms. Who doesn't love a gift basket?! what a great gift….for myself! I love the idea of sending a basket as a hostess gift after the party. This is the perfect idea for a hostess gift during the holidays!! wonderful baskets. A must have. Gift baskets are always so fun. I have made several to give as gifts. It would be nice to have one already made. Just in time for Christmas… thanks for the entry! There are so many great gift baskets! What a fabulous way to let people know you're thinking about them! Thanks for the opportunity! Great gift ideas! Thanks for the great giveaway. It would be great to send this to a brand new mommy! So pretty! I want to Win! Yay! This would make Christmas shopping a little bit easier! What a generous way to help others enjoy the season. oh how cute. glad i know aboug the site now. Too many choices! I like the wine ones. I think these gift baskets make great Christmas gifts, can I send one to myself? I'm a fan of sending gift baskets. I'd love to win and send the Arbor Afternoon gift basket to my “grandmother” in KY.
What nice gift baskets. Please count me in to win. This would be perfect for my mother-in-law. Thanks! The stuff in the baskets look SO yummy!!! I would love to win! I would love to give a gift from this site to my mom. This would be very helpful for the holidays! 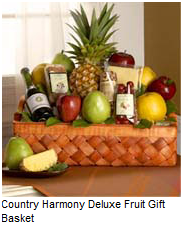 Wow, I would love to send my daughter's famly the Country Ham Deluxe Fruit Basket!! I subscribe to Healthy Mom's via email. I would love a fresh fruit basket for sure. I really like the Martha Stewart afternoon tea hamper and the breakfast in Maine Hamper. This is awesome! Thank you for the chance to win! These look good. I especially love the look of the cookie sets. ooooh, i think i want them all! this is a great company and I would love to win! There is a vase of roses with 50-100 blooms that would make a wonderful gift from 1 800 flowers! Those baskets look great! Thanks! I added this contest on digg. I'd like to have a bonsai tree from 800 flowers! I digg this contest!! How cool would this be to win?!?! wow, what a wonderful prize! This would make getting a gift for my mom (who has EVERYTHING!) much easier. I follow Healthy Moms on FB! This would make such a great gift for the holidays. What a great idea for the holidays. Thank you! Still looking for some hard to buy for folks–this would be awesome! Thanks for the chance! This would be great to send my dad something. This would be great to give my mom or grandma a basket for their b-day. THanks. 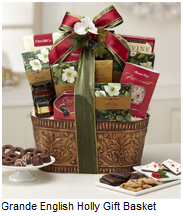 I would love to have an excuse to send someone I love a gift basket! Thanks so much! I would love to give this to someone special this year. What a perfect gift! I love to receive little surprises like this, and love even more to send them to other people. Thanks for a really great giveaway! These baskets would make great Christmas gifts. I would love to send something to my grandmother for Christmas. Wow – what a great prize! Thanks for the giveaway! I really like their fruit baskets. If I won this I would love to send something special to my sis. Facebook fan of Healthy Moms. I grabbed your 12 Days of Christmas Button for my blog. The sheer variety of basket options is mind-boggling. Great baskets. I like the Godiva® 22 pc Milk Chocolate Gift Box. Please accept my entry. Thank you. Those baskets are pretty!! I would love to win one for the holidays!! Thank you for the giveaway, the baskwt look delicious. I would send a basket to my sister. My mother is tired of all the “fruit baskets” she gets from my brother. Those are some yummy looking baskets! this is a awesome giveaway. I'd get the “Majestic Oak Grandeur Gift Basket” with the $50 Gift Certificate. There are such a variety of baskets from cookies to spa items. Thanks for the opportunity. I always love gift baskets and this one from 1800flowers looks fabulous! Wow, those are some cool baskets!! Would love to win!! I love giving gift baskets as gifts and watching peoples faces as they go through them. They really have a great assortment of baskets. They have lots of great gifts to choose from..would love to win! Any of these wonderful basket would be a gift I would be proud to send! Love these baskets…It would be hard to narrow it down to one deserving person and one basket, but I'm always up for a challenge. I love giving and receiving gift baskets. There's always such a nice variety of related products. This would be a really great gift for my grandparents. The Hahn Estates® Wine Pairing would be great for my father for his birthday. Their meat and cheese baskets look delicious. I would love to have this. I could get something really nice for my mom! ooh it would be fun selecting an item using the gift certificate! They have such beautiful gift baskets! I would love to win this great giveaway! These are such gorgeous baskets, I'd love to give one as a gift! I also subscribe by email! What a great gift this would be. If I win I'll send a basket to my parent's for Christmas, these look great. This would be a great gift for someone I know!! Those are very full gift baskets,very well done and pretty.I would be happy to send one to a friend. This would be great for my in-laws! I can't afford to buy a filled one, so Im making my own for some people. This would be so much better though! I would love to win this for my mom for Christmas!! WHat a great bunch of gift baskets! I would love to give one to our neighbors who have done SO much for our kids when things have been rough this year!! I am connected by Google Friend. thanks! These baskets are gorgeous & filled with such goodies, what a fabulous gift. This would be fun to spend! This would be wonderful since I haven't even started to think about what to get my MIL and since I live 12 hours away from her, whatever I get will be late. I would look like a good DIL. There are many great baskets I would love to get. I like the Premium American Handcrafted Cheese Gift Basket. I'd share it with my family. Thanks! sweet baskets — thoughtful gifts. I would love the Harry London® Happy Birthday Sweets Tower! Thanks for the chance to win something so great! Looks like a great selection of gifts here. My mother-in-law's 90th birthday is coming up soon, and one of these beautiful baskets would be a lovely gift for her! Those baskets sure are pretty!! I would love to win one for the holidays. I didn't know there was such a thing as 1-800-baskets.com What a great idea! The baskets look wonderful and I'd love to win one. I hope I win! I know just the person who I could give a gift basket to!